You never know what you might need when you're on the road. But throwing work tools, safety gear and an extra pair of boots in the back won't cut it. You need a dedicated space for storage in your vehicle. Get your vehicle organized with one of our organization systems. Choose from various under-the-seat and behind-the-seat storage options. We've got plenty of options to help keep the interior of your vehicle in top shape. If you want to be prepared for anything on the road, you also have to be organized. In emergency situations, you don't want to have to search under seats and in a messy truck bed for a First Aid kit or important tools. 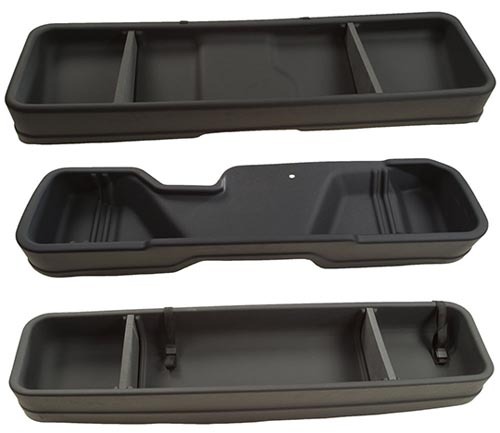 Get your vehicle organized with one of our various storage and organization products. Our custom Gearbox organizers, behind-the-seat storage and other interior organization systems give you a designated place to stash your stuff. You won't lose track of tools, emergency items and other gear with our durable storage cases. Functional storage consoles ensure that everything has its place in your vehicle and stays that way. Our cases and organizers have non-slip surfaces to make sure all your gear stays in place during each ride. Tough, heavy-duty material makes sure your organizers last for years to come and stay free of scratches, stains and cracks. Installation is simple with custom fit pieces and removal is easy when it comes time to clean or reorganize. You don't have to sacrifice function for style, either. With numerous custom fits and functions you'll find a storage system to complete the look of your vehicle and keep it organized for life.